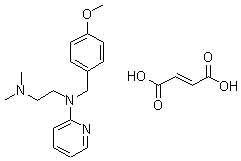 Mepyramine is a histamine H1 receptor antagonist and binds with high affinity to G(q/11) protein. Mepyramine maleate is found to be a potent inhibitor of CYP2D6 (P450 2D forms) in hepatocytes, and PAF-induced platelet aggregation. Mepyramine is commonly utilized as a radioligand ([3H]Mepyramine) binding assay for the H1 receptor. This product has been recently discovered to exhibit blocking ability of KCNQ/M channels which is potentially related to an adverse effect seen in excess intake of antihistamines.